“La Bohemia is much more than a hotel. After meeting in Santa Barbara a half decade ago, Andy and Erin Wheelwright quickly discovered a shared passion adventuring – at the Hollister Ranch, through the Patagonia, to Tahiti and Nicaragua, and in the glamping, textile import, and real estate trades. They dreamed up a life together where Erin could pursue her business and creative interests, Andy could be true to his adventurous nature, and they could both be present to raise their children when they came. The Wheelwrights rode the waves of married life together, and their experiences collectively shaped a shared vision so clear that it took only the right opportunity for their vision to take form. When they visited Todos Santos, an artsy surf town a quiet hour northwest of the bustle of Cabo San Lucas, they came across a dated youth hostel that was for sale and knew their dream had a chance to come to life. Andy and Erin purchased the hostel that would become La Bohemia Baja Hotel Pequeño, and on the day the deal closed, they found out Erin was pregnant. Over the next nine months, they moved from California to Mexico with their two dogs Moose and Palta, started the remodel, had it destroyed by Hurricane Odile (during which the family took cover in a corner of one of the hotel’s bathrooms), rebuilt, saw Andy through dengue fever, enjoyed a January 2015 launch party with 200 locals, and welcomed the birth of their healthy baby girl. 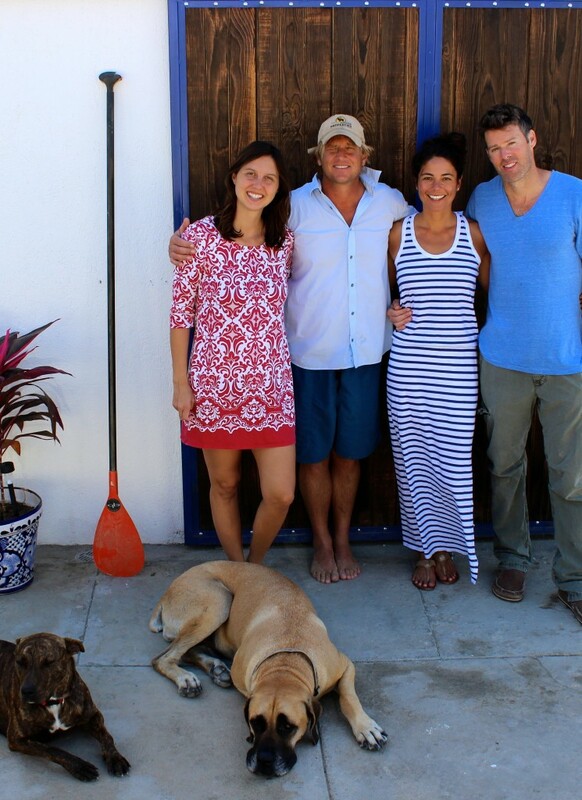 My husband Dave, who is childhood friends with Andy, and I traveled to Todos Santos last week to see the Wheelwright clan – Andy, Erin, baby Lada, Moose and Palta – and to experience the magic at La Bohemia Baja. Highlights included a hike to a secluded bay followed by stops at two local taco shops (one pastor and one fish – delish! ), an evening preparing the day’s fresh catch at the hotel with a bunch of their local friends, and a free-diving and whale watching excursion. Erin’s creativity shines in the hotel’s design, the clean and bright color schemes, and the textiles included throughout. Andy’s adventurous spirit is alive in experiences he shares with guests and partnerships he is seeding with local boaters, divers, surfers, and an array of sport drivers. You’ll just have to go there and listen to them tell the story of how they created their dream to rebuild La Bohemia into what it is today…all the while awaiting the birth of their first daughter. Theirs is a great story of passion and resilience and is definitely worth hearing from the source. Prepare to be inspired! Q. What has been the best part of creating La Bohemia Baja together? The best part of this process has been working together and seeing our strengths and weaknesses play off of each other to create something that we are both really proud of. The reason we wanted to start La Bohemia is so that we could start a family in which we could both be equal partners in the involvement of our baby. So ironically the day we signed on the hotel that dream started to make itself more real. Now that the hotel is open and Lada is born, we really get to see the benefits of our choice to raise our family together, in a different country, while meeting different types of people and hearing different languages everyday! We also wanted to be in a place that was affordable to live and create a life together. Being in Mexico has allowed us to design and make 90% of our hotel unique. From our headboards to our doors and windows, we designed and made everything in Todos Santos with local artisans. We have been able to showcase what talent is here within this small village. But I would say finally realizing a dream that we had put out there for almost 4 years. Just to start to make that happen, was by far the best part about creating La Bohemia. Q. What has been your greatest challenge in pursuing this shared passion together? Well I don’t recommend being pregnant 🙂 That was definitely a challenge for us, because the days were long and filled with decisions. I say that our daughter will probably be the bossiest of us all because she just sat in my belly and listened to us command this place to action for all 9 months. The construction took longer than we expected. With the hurricane, we didn’t get to open when we thought we would, so by the end money started dwindling. In the end, this was a challenge but we knew what we were creating was going to be fun and interesting and that we just had to stick in there and keep giving it all we had. We knew the whole time that even if we had no money left in our bank account, the decision to jump ship and try to do something we love together was worth every penny. What do they say, “If you never try, then you never fail” so everyday we just wake up and try. Q. What advice do you have for people who want to take a leap of faith to pursue a big dream or a creative endeavor? You should just do it. If you have the money and the idea, go for it. The thing is, that the world you are leaving behind will always be there when you get back. The only other consideration is location. Andy and I looked all through South America which is absolutely amazing and untouched, but we also knew that our family and friends may come once… in their life. WE wanted a place that was hidden but easily accessible. Family is big for me and it’s nice to be able to pop back and forth to your life when you need to. Todos Santos allowed us this luxury which was one of the main factors for us living and starting a business here. Q. What does “choosing love” mean to you? One day at a time. When Andy and I first started dating we both realized that in the end we are on this journey of life by ourselves. Yes, we get to be together BUT ‘to thy own self be true.” By allowing each other to be who we truly are, taking the good with the bad, and accepting that we could both flourish in this journey together and separate, La Bohemia became much bigger than just a hotel: It became the story of our life, our love and our adventure. The only other thing I left out is that I’m married to a super hero. I truly don’t know anyone else in the world that would and could’ve worked as hard as Andy. He is such a doer. He managed a crew of 20 people everyday – painters, to abaniles (stucco crew), to cement, to design. He was up at 5 and down at 10. He did all of it with a smile on his face, while being kind and making our crew of workers our friends. His desire to be in another country and know the culture and the language runs off on me everyday. So I’m just happy I found someone to take this crazy leap with! 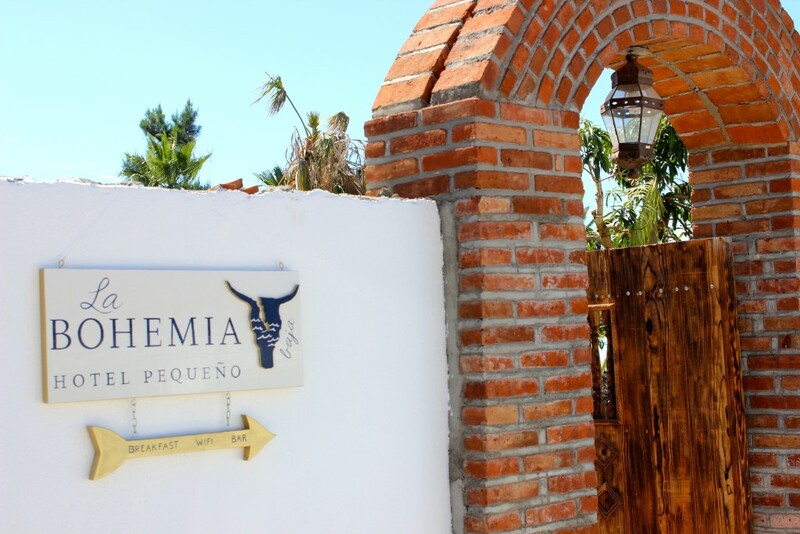 La Bohemia Baja Hotel Penqueno: The friendly and stylish boutique hotel in town. Go there for community, great service, and local flare. Plus all of the above! Rancho Pescadero: Beachfront and tastefully designed, this hotel 15 minutes south of Todos Santos is a real gem. The Machine: Ask Andy and Erin about the best pastor tacos around. Hierba Buena: I could hardly believe this farm to table restaurant surrounded by organic gardens existed in the small Baja town of Pescadero. Yum. La Casita: In the town of Todos Santos, owner Sergio boasted a Tokyo-worthy chiriashi bowl. I was very impressed. Freediving & Whale Watching with Colin: La Bohemia will hook you up with a fun whale watching or freediving adventure with their knowledgeable friend, Colin. Surf, hike, motorbike: Again, ask Andy and Erin! You should highly recomend MI COSTA sea food restaurant in Todos Santos, the owner Jose Luis, and his brothers cook the best garlic- shrimps of this planet and their sea-food soup homemade style, ( recipy of their mom) is out of this planet. And the prices would surprise you even more.